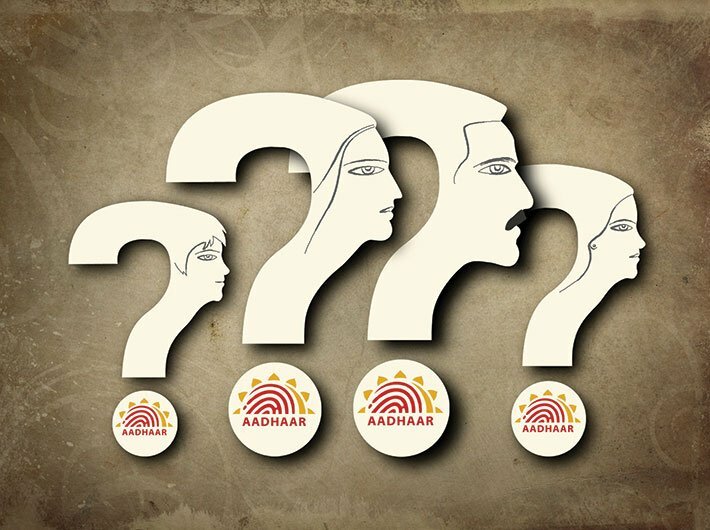 Ever since the unique identity number, or Aadhaar, was introduced in India, it has carefully avoided spelling out its status – whether it is mandatory or not. The official stance, even after a change in government, remains that Aadhaar is ‘essential’ to avail specific services but it is voluntary on the citizen to apply for it or not. The long-awaited law, passed last year, has also avoided the word ‘mandatory’, even as the supreme court in a series of verdicts has maintained it cannot be mandatory. Section 7 of the law states that anyone who wants to avail government subsidies must produce the Aadhaar card. But the supreme court, in its September 2016 ruling, reiterated its 2015 ruling, saying that the unique identification number cannot be made mandatory. Blatantly flouting this interim ruling, many government departments have made Aadhaar mandatory. For example, the Employees’ Provident Fund Organisation (EPFO) made it mandatory to draw pensions. The latest to join the bandwagon is the department of food and public distribution – for the highly sensitive PDS. In February, it stated that those buying ration from fair price shops (FPS) must show their UIDs at the counter from June onwards. Supporting this initiative, Ravi Shankar Prasad, IT minister, said that the government will make all 5.58 lakh FPS Aadhaar-enabled. The ration shops in Gujarat, Andhra Pradesh and Rajasthan are already Aadhaar-enabled, he added. But this move by the ministry of food and consumer affairs is seen as a u-turn from its earlier stand. In 2015-16, though it had pushed for Aadhaar-enabled FPS across the country, and initiated direct cash transfer in place of subsidised ration in all union territories, it had publicly maintained that Aadhaar was not mandatory. Now, the ministry’s new stand has kicked up a storm. 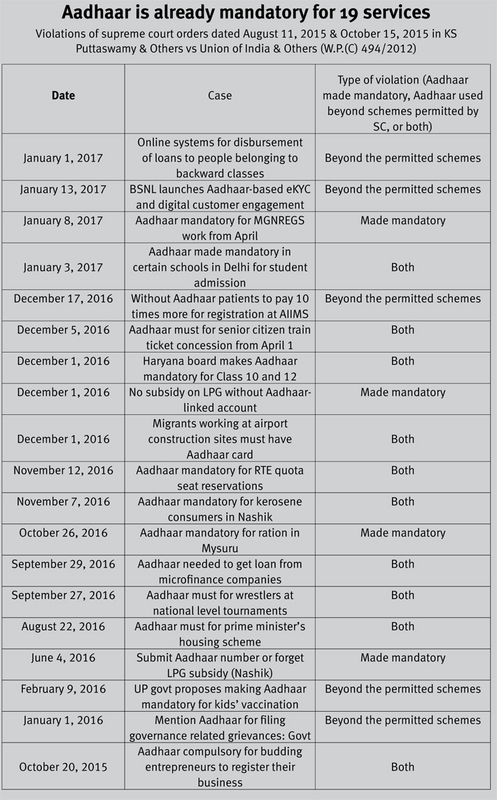 The age-old arguments for and against a mandatory Aadhaar and its ability to curb corruption in PDS is far from over. Aadhaar originally derives its power from the ability to weed out ghost beneficiaries, that is, fake names on record, and multiple beneficiaries. If used with discretion, Aadhaar can plug the mammoth leakages in the PDS, and improve it for the targeted beneciaries. Civil society activists, on the other hand, are wary of Aadhaar’s impact on ration distribution under the National Food Security Act (NFSA). According to their surveys in Delhi, Rajasthan, Jharkhand and Telangana, the fraud in the PDS relates to the quantity of ration and not to any identification of the beneficiary. “The government keeps reiterating its belief in ‘evidence-based policy making’. Its own evidence shows that Aadhaar integration in the PDS has been a disaster,” says Reetika Khera, an economist. “In Rajasthan, we found that in many cases biometrics of beneficiaries don’t match, as their fingerprints are blurred. When the department asks the dealers to distribute the ration without authentication, they would just siphon it off,” she adds. Several times, even if the ration is given after Aadhaar authentication, the quantity would be less. “In spite of this, the government has made it compulsory. Should we infer from this that the government’s intention is to ruin the PDS?” she asks. The story doesn’t end here. 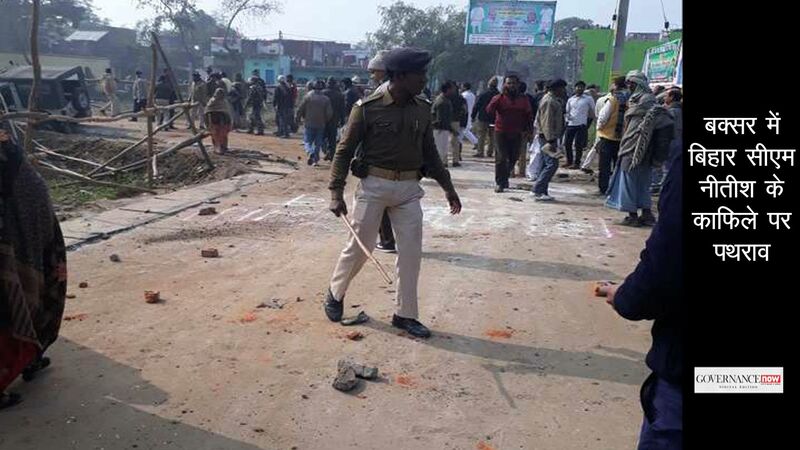 “In Kukarkhera panchayat in Rajsamand district, one of the dealers siphoned ration of 77 beneficiaries by authenticating himself those many times,” reveals Shankar, an activist with Mazdoor Kisan Shakti Sangathan (MKSS). An FIR was filed against the dealer. The Rajasthan food department found similar cases in Alwar and a few other places, he says. The officials found PoS transactions at 5 am and 11 pm, which alarmed them as FPS are usually open during the day time. 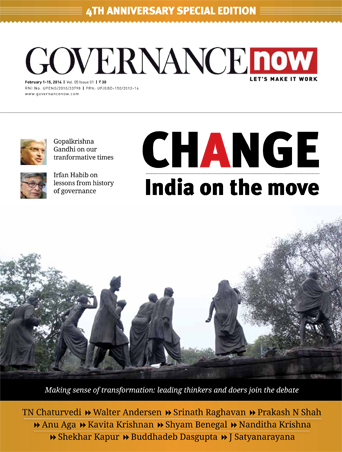 According to Sunil Abraham, executive director, Centre for Internet and Society (CIS), it is a technological utopianism to think that making Aadhaar mandatory would end corruption. “Look at what happened in the case of Aadhaar being made mandatory in the distribution of subsidy. In Karnataka, a team of officials found that fake Aadhaar numbers were used for diverting subsidised LPG cylinders,” Abraham said. In any case, with making Aadhaar virtually mandatory for PDS, the government is clearly going against the SC ruling. The SFLC has made a list of 120 cases where the government has violated the SC ruling between September 2015 and September 2016 (see box). It has also sent the list to MP Rajeev Chandrasekhar, requesting him to seek clarification about the government’s position. The organisation is yet to receive a response.